Makes working with all types of chocolate easy, including melting and warming. Ensures the coating is always ready to use without having to be reheated, and prevents stains. 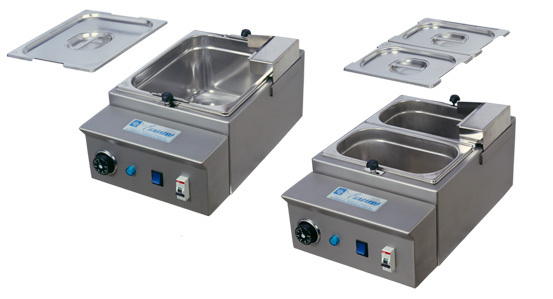 Is fitted with a Gastro-Norm vat and lid, submerged in a “Bain Marie”, which guarantees an even temperature throughout. Precise thermostatic regulation to ensure the coating is kept at the desired temperature. Fitted with a scraping device for the spatula. Reinforced heaters. Made entirely of stainless steel (AISI 304). Can be completely dismantled for cleaning. Can also be used for other preparations requiring the “Bain Marie” technique.